eCommerce stores get three types of traffic: People who definitely will buy, people who definitely won’t buy, and people who can be influenced to buy. There’s no sense spending time, energy, or money worrying about the first two groups. If someone strongly intends to buy (and is willing to overcome obstacles to do so), you already have the sale. If someone definitely won’t buy, you never had the sale anyway. The third group is most important – the people who can be convinced. The best opportunities to increase your conversion rates and revenue are by focusing on these people. But convincing shoppers to buy is only part of the equation. You also have to convince them to buy from you instead of your competitors. Once shoppers start to browse your site, you have to keep them there. If you make any of these mistakes, there’s a good chance your shoppers will bounce off your site and head straight to one of your competitors. Want to compete with the big online retailers? Make sure your eCommerce store has these essential features. Online shoppers are more concerned about their privacy than ever before. According to the 2017 CIGI-Ipsos Global Survey on Internet Security and Trust, 49 percent of Internet users still don’t trust shopping online. Cybercrime has become a serious threat, so their concerns aren’t unfounded. If customers aren’t sure their personal and financial data is safe, they’ll go somewhere they trust. Without those security symbols, shoppers won’t trust your site enough to enter their credit card number. By securing your site, you improve its integrity and your search engine position. Speak to your website host about installing an SSL certificate. There’s a small yearly cost (usually $30-$40 per year). Many hosts have a one-click installation option in the account dashboard. You can also ask about using Let’s Encrypt to see if your host support installing free SSL certificates. SSL (secure socket layer) is a technology that encrypts and decrypts messages transmitted between a customer’s browser and a server. Basically, it’s a method of obscuring data so hackers – or any third party – can’t read it. This protects sensitive information, like customer identities and credit card numbers. If your store has a large inventory, your customers probably use your internal search feature to find the right products. This is especially true if you sell products shoppers look for by product number, part number, ISBN, or other identifying information they don’t want to scan for in a list. But if your search feature doesn’t find the items in your inventory, or doesn’t display the results in an intuitive way, your shoppers will go somewhere else. Keep in mind that most people won’t spend a lot of time searching your site. Even if your search feature works, shoppers will go somewhere else if they don’t find their products within the first couple searches. If your eCommerce platform lacks an internal feature, or you aren’t happy with it, install a special app, widget, or plugin. Shopify has a number of free and paid search features. So does WooCommerce. 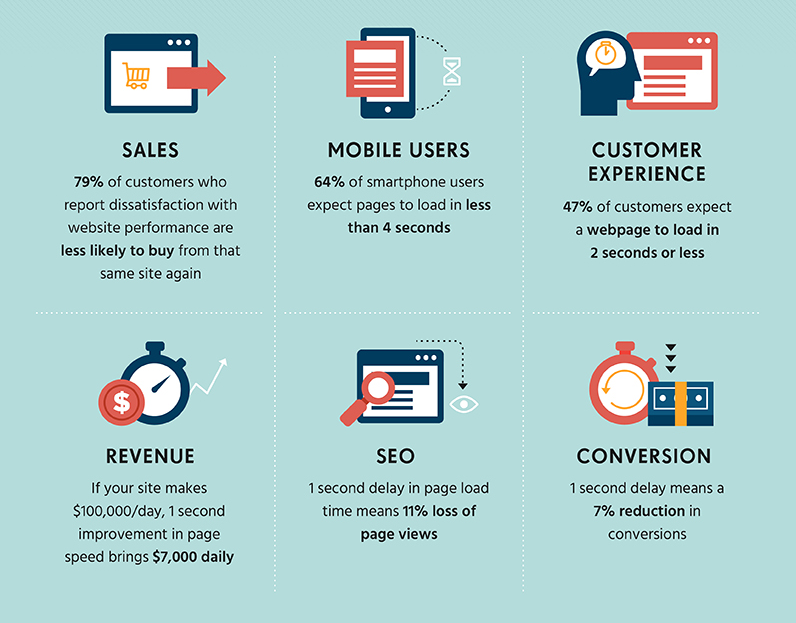 40 percent of shoppers will leave your site if it takes more than three seconds to load. According to Skilled, mobile users are almost as impatient (they’ll wait four seconds), and for every one second of delay, your conversion rate drops by seven percent. Unless you’re already a popular online retailer or your customers have a specific reason to buy at your store (maybe they have a coupon or need something only you sell), shoppers encountering slow page loads will assume your site doesn’t work and go to one of your competitors. Update your shopping cart and all apps, plugins, and add-ons. Optimize your images, GIFs, and video for smaller file sizes. Identify broken links and eliminate them (these still trigger an HTTP request). Speak with your host about improvements. They might recommend a pricier hosting plan, but that’s the cost of doing business. Minify your code (compress it so it’s as small as possible). Get rid of your homepage slider. It’s ineffective, anyway. Don’t use popup “quick view” windows. Some of these features force the page to load all of the popup’s content when the page loads, which increases loading time. Remove any apps, widgets, or plugins you don’t use. When shoppers reach the checkout part of their shopping experience, they’re anxious to finish the process. They’ve done the work, now they want the payoff. 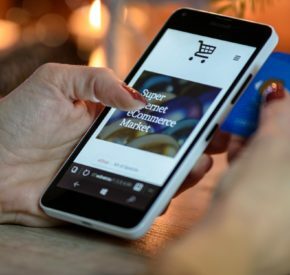 But if your checkout process is overly complex, you’ll create friction that may trigger shoppers to abandon their carts and buy somewhere else. 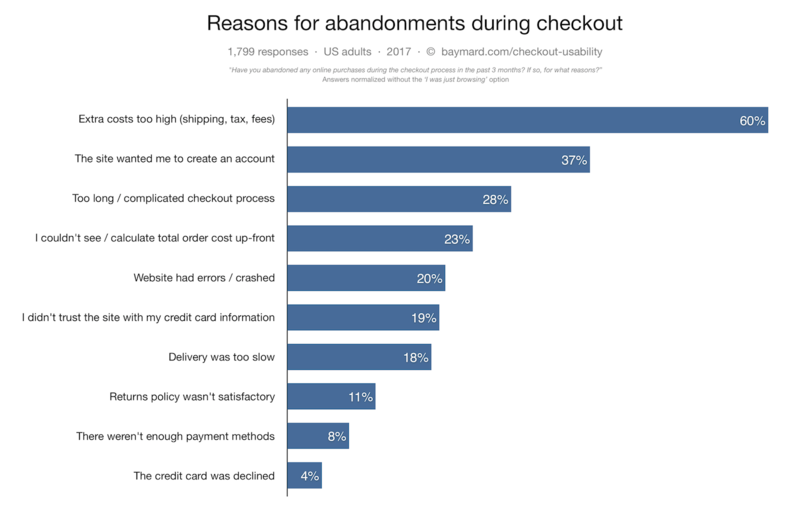 According to the Baymard Institute, 28 percent of people say they’ve abandoned their shopping cart because the checkout process was too complicated. Not forcing customers to enter the same information multiple times. Make the final cost (taxes, shipping, and fees) absolutely clear before checkout. Not forcing shoppers to create an account before checkout. Offering upselling opportunities before checkout. Reducing the number of form fields as much as possible. According to Baymard, the top 50 eCommerce sites in the United States use 15 form fields on average. However, you may not need that many. Only use the fields you absolutely need. While there’s no doubt that images and videos are important parts of your product pages, they aren’t enough to convince customers to buy. You need to include quality and unique product descriptions. They lead to better organic search results. They reduce shopping cart abandonment. They reduce return rates (because the customer knew what they were buying). They reduce customer service questions (because the description preempts them). And yet, many eCommerce stores leave their descriptions blank, fill them with unhelpful information, or simply use whatever copy the manufacturer supplies. These methods fail to communicate the benefits of the product and tell the shopper what they need to make a purchasing decision. Write unique product descriptions for every product that explains why the shopper will find the product valuable. Yes, this could be time-consuming and/or expensive if you have a lot of products, but they’re worth the effort. You can use the manufacturer’s stock description as a template, but write your own version. The final mistake you might be making is also the simplest: You don’t know what your competitors are doing. This means you can’t ignore your major competitors because customers certainly won’t. Your marketing strategy should include a competitive analysis – a document that analyzes your competitors’ websites, customer experience, pricing, and market positioning. Use your competitive analysis to inform your marketing strategy. For instance, if you notice that everyone in your niche uses a specific product category structure, you should test that structure on your site to see if it improves conversions. Use your competitors as inspiration, but follow your numbers. Measure your conversion rates (micro and macro), your customers’ behavior, their paths through your funnel, and their spending habits. Use these data points to drive your strategy. Download this check list of important eCommerce store features that will help you compete. Most eCommerce niches are quite crowded. There are few (if any) untapped markets anymore. Acquiring traffic is hard enough, which means you can’t let your customers go once they’re on your site. If you’re making any of these mistakes, fix them as soon as possible to improve your conversions. Want to compete with the big online retailers? Make sure your eCommerce store has these essential features. Subscribe to receive this resource and our newsletter.